NEWLY promoted Gold player Riccardo Drayton won the Plate competition in the second leg of the Cuestars Under-21 Tours at Waterlooville Sports Bar. The 12-year-old from Chandler’s Ford, one of the first two players to jump straight from Bronze to Gold, is still finding his feet in the upper tier. 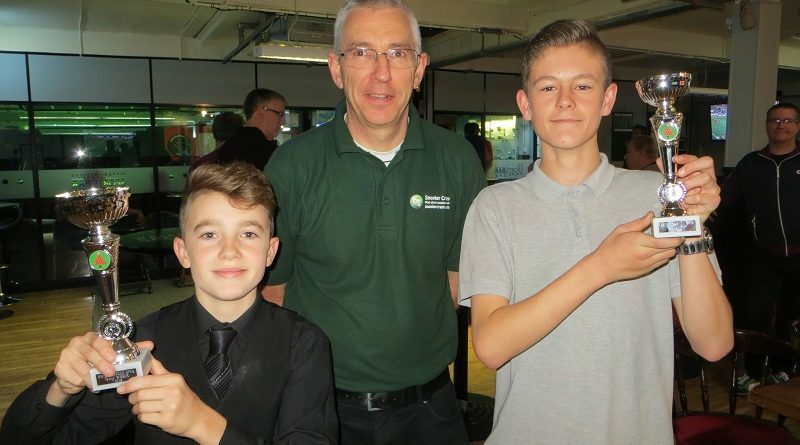 Drayton, conceding a 14-point handicap start, defeated home player Zak Truscott in the final of the event sponsored by Waterlooville-based website Snooker Crazy. The third legs of ten are at Jesters Snooker Club, Swindon, on Sunday, November 4. PRELIMS: Jaydon Elliott (147 SC, Swindon) beat Dean Russell (Waterlooville Sports Bar), Riccardo Drayton (Chandlers Ford SC) beat Keegan Reed (Salisbury SC), Taylor Elliott (147 SC, Swindon) beat Chloe White (Waterlooville Sports Bar). QUARTER-FINALS: Billy Reid (Waterlooville Sports Bar) beat J Elliott, Drayton beat Freddie Turner (Salisbury SC), Zak Truscott (Waterlooville Sports Bar) beat T Elliott, Callum White (Waterlooville Sports Bar) beat James Slade (Crucible, Newbury). SEMI-FINALS: Drayton beat Reid, Truscott beat Callum White.